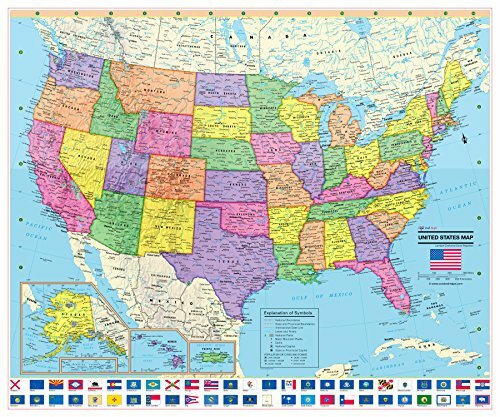 These current 2018 - United States colorful wall poster maps show all 50 state and USA colorful flags. The map shows all state capitals and hundreds of major cities. It features color mountain shading and color banded boundaries for easy recognition. Flags are arranged in alphabetical order in two rows. Each flag is digitized by our expert cartographers and are NOT web/online downloads. Other sizes available. Manufacturer: Cool Owl Sales, Inc. Publisher: Cool Owl Sales, Inc. Studio: Cool Owl Sales, Inc. If you have any questions about this product by Cool Owl Maps, contact us by completing and submitting the form below. If you are looking for a specif part number, please include it with your message.